Sanders: "On our worst day I think we have a lot more to offer the American people than the right wing extremists...I know something about economic anxiety and living in a family that does not have sufficient income and that is why I have pledged...to bring about a political revolution where millions of people begin to stand up and say 'enough is enough, this great country and our government belong to all of us.'" O'Malley: "Tonight what you listened to was a healthy exchange of ideas...When you listened to the Republicans debate the other night you heard a lot of anger and a lot of fear...they can have their anger and they can have their fear but anger and fear never built America." Clinton: "On January 20, 2017 the next president of the United States will walk into the White House. If, heaven forbid, that next president is a Repbulican I think its pretty clear we know what will happen. A lot of the rights that have been won over the years from women's rights to voter rights to gay rights to worker rights will be at risk...This is a watershed election. I know how important it is that we have a Democrat succeed President Obama in the White House and I will do all that I can in this campaign to reach out and explain what I stand for and what I will do as president." She closed by saying, "Thank you, good night, and may the Force be with you." 10:37 p.m. O'Malley gets a question about whether his wife, Katie, would have to give up her work as a district judge if he were elected. "That would be totally up to her. Katie has never been a person who let her husband's professional choices get in the way of her dreams," he said. "Katie O'Malley will do whatever Katie O'Malley wants to do regardless of whether her husband gets elected." 10:34 p.m. A question for Clinton, who held this role: Is it time to change the role of a president's spouse?
" The role has been defined by each person who has held it and I am very grateful for all my predecessors and my successors because of them did what she could to support her husband and her country but also chose to work on issues that were of particular concern," Clinton said. "With respect to my own husband, I am probably still going to pick the flowers and the China for state dinners and stuff like that, but I will certainly turn to him as prior presidents have for special missions, for advice, and in particular how we're going to get the economy working again for everybody." As Sanders is asked about his own wife, he took a second to praise Clinton's tenure as first lady. She "redefined what that role could be." 10:28 p.m. A follow up question goes to Clinton about whether she bears responsibility for the chaos in Libya after the 2011 military intervention. She blamed the Arab Spring and ISIS propaganda for destabilizing the country. "What we're seeing happening in Libya right now is that there has been a fragile agreement to put aside the differences that exist between Libyans themselves to try to dislodge ISIS...and to try to create a national government," she said. "This is not easy work. We did a lot to help." Raddatz pressed her over whether mistakes were made, and Clinton said, "There's always a retrospective to say what mistakes are made...we offered a lot of help and it was difficult for the Libyans to accept help." 10:25 p.m."I agree, we need to reign in the overprescribing," O'Malley said, but he also called for a $12 billion federal investment for local partnerships and said there needs to be more intervention at hospitals. 10:22 p.m. The debate shifts to heroin abuse, as Muir talks about a poll that showed 48 percent in new Hampshire say they have known someone who has abused heroin. Sanders said that part of the solution is telling doctors prescribing opiates and pharmaceutical companies to "get their act together" to help fix the problem. Plus, he said, addiction should be treated like a disease and not a criminal problem. Clinton says the federal government should offer $10 billion over 10 years to work with states to come up with a plan to fight the heroin epidemic. "There are too many opioids being prescribed...that leads directly to heroin addiction," Clinton said. 10:19 p.m. Sanders focused his comments on reforming the criminal justice system. "We need major, major reforms of a very broken criminal justice system," he said, and called for an effort to end institutional racism. "Police officers should not be shooting unarmed people, predominantly African Americans," he said. He also said it is important to make police officers look like the communities they serve. 10:16 p.m. The debate turns to race as Clinton is asked how to bridge the divide between civilians and law enforcement. "We need to get a bipartisan commitment to work together on this and we need to hear the voices of those men and women and boys and girls who feel like strangers in their own country and do whatever is necessary to not only deal with the immediate problems within the criminal justice system, but more opportunities, more jobs, more education," Clinton said. O'Malley talked about his experience as mayor of Baltimore -- increasing drug treatment, using data to protect the lives of young people and doing a better job of policing the police. "We reported excessive force, discourtesy, lethal use of force," he said. "As a nation, we have to embrace this moment and make our departments more open." 10:08 p.m. O'Malley said what sets him apart is the experience balancing a budget every year when he was governor of Maryland. He has called for expanding Social Security and giving paid family leave. He also called for higher taxes on top earners. One entitlement the U.S. cannot afford, he said, is "the entitlement that the super wealthy among us -- those earning more than a million dollars -- feel they are entitled to pay lower income tax rates and a far lower preferred tax rate when it comes to capital gains." 10:05 p.m. Clinton reaffirms her pledge not to raise taxes on middle class families. "I don't think we should be imposing new big programs that are going to raise middle class families' taxes...we've got to get back to where people can save money again," she said. Sanders said Clinton is going against President Roosevelt on Social Security and President Johnson on Medicare -- as well as progressive Democrats, who argue for small tax increases to pay for things like paid medical and family leave. 10:04 p.m. The debate turns to taxes. "Now this is getting fun!" Sanders exclaims. 10:01 p.m. As O'Malley talks about his plan to give students access to a debt-free college education at any in-state university, he thanks Clinton for "borrowing" many of his ideas in her own plan. Clinton calls for debt-free public tuition and said the U.S. should focus on poorer families, not eliminating tuition for everyone. 9:59 p.m. Sanders is talking about his education plan, which would put a speculation tax on Wall Street to eliminate tuition at public colleges and universities altogether. "If we are going ot be competitive in the global economy we need the best educated workforce," he said, calling it "insane" that some people cannot afford to go to college. Read more about where the candidates stand on college affordability here. 9:53 p.m. Asked about rising premiums for health insurance, Clinton said, "I would certainly build on the successes of the Affordable Care Act and work to fix some of the glitches." She said she has proposed a $4,000 tax credit to help people who have very large out of pocket costs and wants Medicare to be able to negotiate for lower drug prices. Additionally, Clinton said, the health care exchanges need to be "properly regulated so we are not being gamed." 9:48 p.m.O'Malley argues that he has a better plan than both of his rivals, saying, "We're not going to fix what ails our economy...by either trying to replace American capitalism with socialism...nor will we fix it by submitting to Wall Street-directed crony capitalism." "I had the backbone to take on Wall Street in the ways that Secretary Clinton never, ever has," he said, and recalled what he termed "shameful" comments Clinton made in the last debate linking Wall Street, campaign finance and the terrorist attacks on 9/11." Clinton fired back, saying O'Malley had "no problem" going to Wall Street bankers to raise money when he was the head of the Democratic Governor's Association. 9:44 p.m. Sanders gets the same question -- and the answer is no. "Hillary and I have a difference. CEOs of large multinationals, they like Hillary, they aren't going to like me. And Wall Street, they're going to like me even less. 9:42 p.m."Should corporate America love Hillary Clinton?" Muir asks. "Everyone should!" Clinton responds. She went on to talk about leveling the playing field but also describing herself as someone interested in creating jobs. "If people who are in the private sector know what I stand for...and they want to be part of once again building our economy so it works for everybody, more power to them." 9:40 p.m. Candidates are outlining the broad strokes of their economic policies as the debate shifts to the economy, taxes and healthcare. 9:26 p.m. Clinton and Sanders continued to spar over whether the U.S. should focus on removing Assad and destroying ISIS at the same time. The former secretary of state argued that the fighters on the ground who oppose Assad need to know there is a diplomatic channel in place to change the leadership. Sanders stuck to his position. "Yes, of course, Assad is a terrible dictator. But I think we have got to get our foreign policies and our priorities right. It is not Assad who is attacking the United States. It is ISIS," he said. The major priority, he affirmed, "should be the destruction of ISIS." O'Malley argued that the U.S. should not be determining which dictators around the world must stay and go. "We have a role to play in this world but it is not the role of traveling the world to look for new monsters to destroy," he said. 9:22 p.m. Sanders calls for focusing on destroying ISIS in Syria first, and removing Syrian dictator Bashar Assad second, repeating a frequent argument against regime change. In response. Clinton hits Sanders over voting in favor of the U.S.-led campaign of airstrikes that helped depose former Libyan dictator Muammar Qaddafi. If the U.S. had not done that, Clinton said, "you would be looking at Syria. 9:21 p.m. Clinton dismisses a question on whether she would be willing to shoot down a Russian plane in a no-fly zone over Syria. "It wouldn't come to that," she said, arguing that the U.S. would be able to work with Russia on the no-fly zone. 9:18 p.m. Clinton says a question about whether she is willing to risk having to send more and more forces into the Middle East to defeat ISIS is a "false choice." She listed a number of things she said the U.S. must do in combination to defeat the group: Lead an air coalition, build back up the Iraqi Army, talk to sheiks in the Anbar province, get the Turks to pay more attention to ISIS than the Kurds and build a coalition of Muslim nations on the ground. 9:13 p.m. Raddatz pushes Sanders over how he will convince Muslim nations to put troops on the ground to fight ISIS, since he does not want U.S. combat troops in the region. "My plan is to make it work, to tell Saudi Arabia that instead of going to war in Yemen, they...are going to have to go to war against ISIS. To tell Qatar that instead of spending $200 billion on the World Cup, maybe instead they should pay attention to ISIS which is at his doorstep," he said. 9:08 p.m. The moderators point out that the governor of the state hosting the debate, New Hampshire's Maggie Hassan, has called for a halt in accepting refugees from Syria. I don't think a halt is necessary," Clinton said, calling for "increased vetting and screening." "The process should move forward while we are also taking on ISIS," she said. O'Malley said there are far greater vulnerabilities than those posed by refugees, and that the U.S. should take in more than the 65,000 refugees he has called for if necessary. 9:05 p.m. Fielding a question about whether the government should force tech companies to give them a back door into encrypted communications, Clinton calls for a "Manhattan-like project" to figure out a way to bring the government and tech community together to find middle ground. She said she would "not want to go to that point" of forcing tech companies to preserve a back door for government, which they argue would also make their products vulnerable to hackers. "I would hope that given the extraordinary capacities that the tech community has and the legitimate needs and questions...that there could be a Manhattan-like project...they've got to be partners," she added. O'Malley also weighed in: "I believe we should never give up our privacy," he said. He then talked about the importance of preserving the freedom of religion. "What I say to those people who go to Donald Trump's rallies: He thinks a lot minimum wage in America is a good idea...I believe we stand together to address the real issues facing this country," he said. 9:00 p.m. "He is becoming ISIS' best recruiter," Clinton says of Republican candidate Donald Trump, talking about his rhetoric on Muslims and call to ban them from coming to the U.S.
8:59 p.m. Sanders grew passionate when talking about his history with gun control in a state like Vermont. "Do not tell me that I have not shown courage in standing up to the gun people," he told O'Malley. Clinton also said, "I applaud his record in Maryland, I just wish he wouldn't misrepresent mine." Read more about where the 2016 candidates stand on gun control here. 8:53 p.m. Sanders argued, "I'm not going to say that everybody is in agreement...but there is a broad agreement on sensible gun safety regulations." He cited expanding background checks and banning assault weapons as a place where there is broad agreement, and said he would push for those regulations even though he comes from a state with virtually no gun control. Meanwhile, O'Malley went after Clinton and Sanders for a "flip-flopping culture of Washington" on gun control. "Let's calm down a little Martin," Sanders said. "Let's tell the truth here Martin," Clinton chimed in. 8:51 p.m. Clinton is asked about an ABC News poll that shows Americans believe arming more people, not stricter gun laws, is the best defense. "Guns in and of themselves, in my opinion, will not make Americans safer...arming more people to do what I think is not the appropriate response to terrorism. I think what is is creating much deeper, closer relations and yes coalitions within our own country. The first line of defense against radicalization is in the Muslim-American community, people who we should be welcoming and working with," she said. 8:45 p.m. The moderators ask Clinton how confident the American people should be that there aren't people like the ones who committed the San Bernardino shooting who have been radicalized under the radar of authorities. She pivots to her strategy to defeat ISIS. At the end of hear answer, Clinton called for better sharing of intelligence and information, and said the government must work with Muslim American communities. "They will be our early warning signal...that's why we need to work with them and not demonize them like the Republicans have been doing," Clinton said. O'Malley jumps in and says the problem in the fight against ISIS is a "lack of battle tempo." 8:40 p.m. Sanders gets the first question over the voter data breaches, and says again that his staffer "did the wrong thing" and calling for an independent investigation of breaches of voter data. He is still critical of the Democratic National Committee (DNC) for shutting off his access to his data, calling it a "real problem." Asked by the moderators, Sanders apologized to both Clinton and his supporters. Clinton responded, "I very much appreciate that comment," but added, "I don't think the American people are all that interested in this." Clinton: "The American president has to both keep our families safe and make the economy grow in a way that helps everyone, not just those at the top. That's the job. I have a strategy to combat and defeat ISIS without getting us involved in another ground war and I have a plan to raise in comes and deal with a lot of the problems that keep families up at night....we have a distinct difference between those of us up on stage and our Republican counterparts." O'Malley: "I visited with a number of our neighbors in northern Virginia at a mosque last Friday. And as I looked out there at the eyes of our neighbors, I looked into the eyes of veterans, I looked into the eyes of boy scouts...what our nation needs right now is to realize that while we face a terror danger we also face another sort of political danger and that is the danger that democracies are susceptible to when unscrupulous leaders try to turn us against each other." Sanders: "I am running for president of the United States because it is too late for establishment politics and establishment economics. I'm running for president because our economy is rigged, because working people are working longer hours for lower wages and almost all of the new wealth and income being created is going to the top 1 percent...I'm going to create an economy that works for working families, not just billionaires. I'm running for president because we have a campaign finance system that is corrupt...I'm running because we need to address the planetary crisis of climate change...I want a new foreign policy, one that takes on ISIS, one that destroys ISIS, but one that does not get us involved in perpetual warfare in the quagmire of the Middle East but rather works around a major coalition of wealthy and powerful nations supporting Muslim troops on the ground." 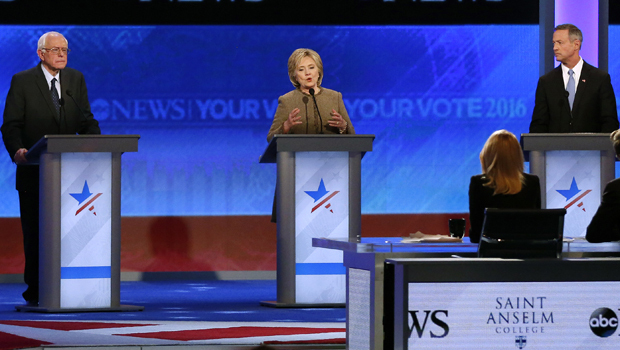 7:50 p.m.Former Secretary of State Hillary Clinton, Vermont Sen. Bernie Sanders, and former Maryland Gov. Martin O'Malley are preparing to take the stage for the last debate of 2015, hosted by ABC News. The network is also partnering with the New Hampshire Union Leader, one of the state's largest and most influential papers. It will be the first and only Democratic debate held in the first-in-the-nation primary state of New Hampshire during the 2016 campaign season. The moderators are ABC's "World News Tonight" anchor David Muir, chief global affairs correspondent Martha Raddatz, and WMUR-TV anchor Josh McElveen will moderate the debate. ABC News has said questions will focus on national security issues and foreign policy, following the deadly terror attacks in Paris and San Bernardino. The Democratic race was interrupted just a day before the debate by a data breach controversy in which a Sanders staffer accessing confidential Clinton voter data. The breach pitted the Sanders team against the Democratic National Committee, with the Clinton campaign adding that it was an "egregious" transgression and "may have been a violation of the law." "This was not an inadvertent glimpse into our data," Clinton campaign manager Robby Mook said Friday on a conference call with reporters. "It was not, as the Sanders campaign has described it, a mistake." The DNC granted access to the voter database back t0 the Sanders campaign early Saturday morning, restoring information that could prove crucial to the team in the weeks leading up to the first nominating contests in Iowa.